NYC Educator: Who Will Be the Teachers of Tomorrow? Now and then, conversations at work turn to the future of the teaching profession. At a PD (professional development) meeting outside of our building earlier in the year, a teacher broached the topic of salaries earned by PD specialists, Pearson employees (see "No Profit Left Behind") and the like. She found seemingly promising opportunities on her phone. She mentioned it bears further inquiry. Imagine not having to manage 175 kids and grade thousands of papers, all while suffering disrespect at the hands of corporate-minded "reformers." Another teacher mentioned to me the fate of a former colleague. She seemed to disappear. She apparently now works at writing curriculum for a district on Long Island. If the story can be believed, she earns a heck of a lot more money than the rest of us. These days there are more opportunities than ever for teacher flight. With only two-to-three years of experience, you could follow in Rhee's footsteps and leave to become an ed. "reformer," not to mention, perhaps, a D.C. Chancellor. You might aim to become another David Coleman--who couldn't manage to teach, but feels impelled to push "state" standards for the nation. Imagine if opportunities open up for the outside observers proposed by Cuomo. But does any of this really help students? Wouldn't it make more sense to make teaching once again rewarding enough to attract and retain the best? At a later point, teachers began to talk about other potential careers. One teacher mentioned her real-estate license. If things get ugly enough, there is always that fallback. Another teacher said a family member would readily employ her. Her benefits would surely suffer some, but the quality of her life would greatly improve. These are smart, caring and hard-working people, increasingly demoralized. They represent the majority. 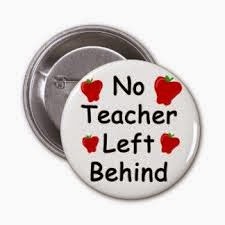 Saddest of all, teachers admit that they would discourage their own children from becoming teachers. Some promised to forbid it. It is no longer the profession we entered. It is not so much about helping kids as playing a game. We must teach to someone else's test, designed to fail nearly seventy percent of the state. We must deflect potential threats; survive the latest variety of "reform." We are scapegoats. In such a climate, so many who can retire, do; many more become demoralized. It is a shame because the people who entered the profession with the best intentions are driven away. In the process, students lose. Society loses. Who will be the teachers of the future?